Vanilla Fudge – second time lucky! | It's all about the cake! It's all about the cake! 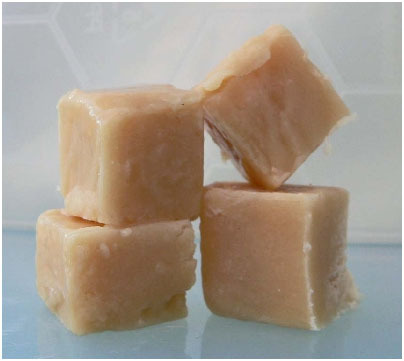 Vanilla Fudge – second time lucky! Thankfully my second attempt at fudge has been a roaring success! My first effort involved condensed milk and ended up in a sloppy, un-fudge like mess. I have now canned the condensed milk (haha) and have bought myself a sugar thermometer in order to get the temperature right – oh yes, we are in exciting times now! So, armed with my sugar thermometer and a new fudge recipe from Hugh Fearnley-Whittingstall, I started on my second effort. And it was extermely straight forward. The thermometer worked perfectly so I knew exactly when the mixture was hot enough and at the infamous ‘soft ball’ stage. And it seemed to set exactly as it was supposed to. And once cooled, it tasted suprisingly like vanilla fudge. I’m keen to try out some more flavours now, but will have to finish this batch first. Lucky that I’m doing lots of running, as it is verrry sweet and I think is signficantly lacking in health benefits – but it tastes good anyway! Using a few drops of sunflower oil on a piece of kitchen paper, lightly oil a 15x22cm baking dish. Put the sugar, syrup, butter and cream in a saucepan, making sure it’s not more than a third full as the mixture will bubble when it boils. Heat gently, stirring all the time, until the sugar has completely dissolved – tip the pan to make sure there are no crystal still visible on the base. Stop stirring. Put a sugar thermometer in the pan and turn up the heat. Let the mixture boil hard until it reaches 116C (soft ball stage). This may happen quite fast or could take up to 15 minutes or more, so keep a sharp eye on the thermometer. Take the pan off the heat and leave to stand for 10 minutes. Add the vanilla and beat vigorously until the mixture thickens, becomes slightly grainy and starts to come away from the base of the pan. This can take up to 10 minutes. Tip into the prepared dish, smooth and leave to cool. Mark into squares with a sharp knife while it’s still slightly soft (I left it too late and it started crumbling). Leave for 2 to 4 hours to firm up completely and then remove from the dish. Researching child-friendly cities and exploring how to get people outdoors and active. One Response to Vanilla Fudge – second time lucky! great recipe – thankyou. I’ve tried to make fudge a few times over the years with not much success. My daughter and i made this this morning and not only has it worked it’s delicious – tastes just like the real thing! Will be adding it to my family book of recipes. Paradise Gardens 2010 – cake cake cake!